"My husband and I were struggling with whether to have a civil or religious ceremony for our wedding, he is quite traditional but I am not at all religious, so we decided to have a celebrant conduct the service, after speaking to a couple of independent celebrants we found Francesca and I am so glad we did. From the first phone call, to our initial meeting, and the day itself, Francesca made the whole experience so relaxed and stress-free. Our service was so personal to us, had elements of the traditional coupled with a more relaxed feeling, we laughed and cried and I feel she captured who we really are, warts and all, which made for a funny and engaging service for our guests. Normally the service is the bit people want to get out of the way at a wedding but so many guests commented on how personal ours was and how much they enjoyed it, and we'd like to thank Francesca wholeheartedly for that, we couldn't have done it with out you." "Our wedding ceremony in the woods was truly magical and Francesca did a brilliant job at delivering our service to 100 people surrounded by nature. Everyone commented on how beautiful and moving the service was and there were happy tears all round from start to finish. It really was the most special part of our day and looking back we could not have imagined it any other way. 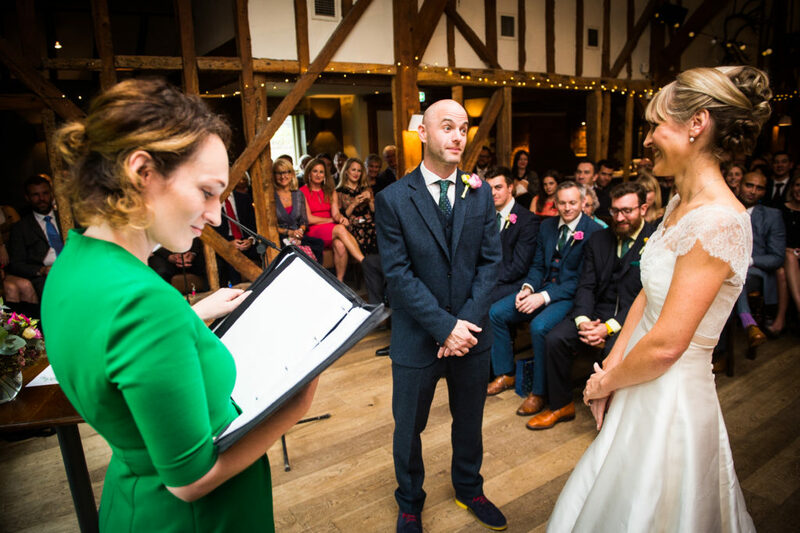 Having Francesca as our celebrant meant our ceremony was truly a great reflection of us as a couple in an honest light with vulnerability, laughter and joy all round which everyone found really refreshing to hear as it was so personal. As the service went on the light shone through the trees and little seedlings were flying around which created a natural confetti! Thank you Francesca for being such an integral part in our special day." “We weren't initially sure whether to use a celebrant, but it turned out to be one of the best decisions we made. Planning our ceremony together with Francesca was one of our favourite parts of the wedding planning process - she really took the time to get to know us as a couple, which definitely showed in the script that she produced for the day.